I’ve posted below three videos that I think collectively do a nice job of addressing major issues underlying the perennial question: what makes us human? In the first video, the always engaging neurobiologist, primatologist and stress expert Robert Sapolsky talks about human-animal similarities and differences, at the 2009 Stanford commencement. Skip to the 5:00 minute mark to go directly to Sapolsky’s talk. 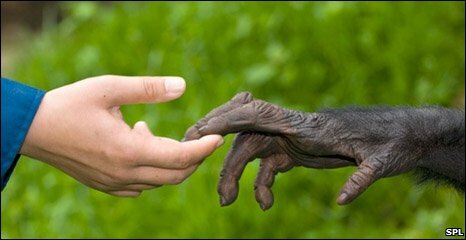 The second video, entitled “What Makes Us Human?”, was produced by The Leakey Foundation, and effectively summarizes several interesting findings from leading researchers on what distinguishes us from other primates. The final and longest video (about 57 minutes) is a presentation by cognitive neuroscientist Martin Sereno that focuses on the origin of the human mind and why humans have significantly more cognitive power than other primates. Cool. Thanks for providing these. I look forward to watching them. Sapolsky is a favorite.